The Georgia Boy Choir﻿ is currently seeking boys ages 5, 6, and 7 to audition to join the Apprentice Choir for our 2013-2014 5th Anniversary Season. Auditions will be held on September 7th and 14th at The Heiskell School, located at 3260 Northside Drive in Atlanta. 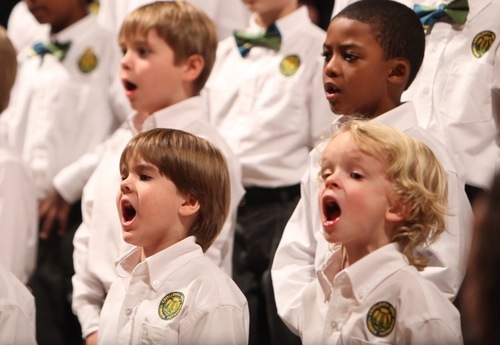 The Georgia Boy Choir is currently seeking boys ages 5, 6, and 7 to audition to join the Apprentice Choir for our 2013-2014 5th Anniversary Season. Auditions will be held on September 7th and 14th at The Heiskell School, located at 3260 Northside Drive in Atlanta. Designed specifically for boys this age, the Apprentice Choir program focuses on helping boys discover the beauty and joy of singing in an environment where fun, hard work, and excellence are encouraged and expected. They begin building the foundation of knowledge and experience that will be necessary for them to advance through the Choir's system. The Apprentice Choir meets once a week for one hour. Auditions are intentionally low-pressure. Each boy is asked to sing a song—any song he likes; it can be something as simple as “Twinkle, Twinkle Little Star” or even “Happy Birthday,” or something he has learned in school or church. "We will then sing some musical phrases and ask him to repeat them, then play a few notes on the piano and ask him to respond. It is fairly simple and only takes a few minutes". No experience or preparedness is necessary. The audition is designed to allow them easily to discern a boy's natural ability. If you are interested in having your son audition for the Georgia Boy Choir click here or if you know someone who has a son that may be interested in auditioning for the Georgia Boy Choir, please forward this email to them using the Forward to a Friend link below. Visit our website or call our office at the number below if you have any questions about the auditions process or participation in the Choir. Georgia Boy Choir is also auditioning older singers for their Training Choir and Intermediate Choir. Click here for more details and to schedule an audition!